It’s been cold here this week. I’ve been spending my days huddled in front of the space heater with a blanket. I am not sure why I have felt so cold all of the sudden… It’s not any colder than it was a few weeks ago when we were icebound for a week, and our thermometer tells me the heat is working. It’s supposed to be in the high 50s all next week and I’m excited! I can tell it’s winter because we got our gas bill the other day – $345. Sigh. I lay awake at night and dream that I somehow obtained a million bucks, and I imagine what I would do with this house. Or even just $50k. It’s easier than dealing with the current reality. I have fun making the graphics every year, and I think this might be my favorite. All the info is on a Facebook – let me know if you’re interested and didn’t get the event invite. I swam twice this week. I was aiming for three times, but it just didn’t happen on Friday. The childcare is only open until 1, so I have to really not dawdle in order to get Savannah and I ready, get to the Y, do all my swimming, take a shower, and pick her up again before 1. The childcare opens up again later in the day, but then the pool is overtaken for the swim team practice so if I want to swim I have to go early. I really do enjoy swimming. It’s great exercise and less painful to me than running. :-) I have heard that it’s slower losing weight by swimming versus running, but I figure if I’m more likely to do it then it’s overall better. I was hoping to do a triathlon, but to be honest I’m not sure I want to put the money to it right now. I’d have to buy a bike, helmet, bike shorts, and perhaps bike shoes. It all adds up! If I decided to race, I would also need to get a cap for swimming and perhaps a racing suit, and some running clothes since pretty much none of my clothes are very comfortable to me. But for now, I can do laps in the suit and goggles I have, and it works fine. I’m hoping if I keep to the swimming and pay more attention to my diet, I’ll lose the weight I’m trying to lose. 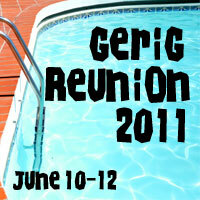 40 lbs by the Gerig Reunion! That’s my goal, anyways. We’ll see… Anyways, that’s enough about that. I get depressed talking about weight. Savannah has learned to say “hi” and “bye”. It’s very cute. Also, today we were at Wendy’s, and she and Paul both got nuggets. At one point, Paul dumped his nuggets onto his tray. Savannah saw him, and in turn dumped her nuggets onto the tray, too. It was very cute! That’s all I got. My life is really not very interesting. I loved your post about diapers! I read it yesterday in my RSS feed and just came over to comment on this post. So, I’m not the only one with a high gas bill, eh? I still can’t get over it there, though – your house is bigger but certainly newer and I bet it is at least 20 degrees warmer there! You could talk to Micah about losing weight if you wanted some tips. I should really take some of them myself. ;) His goal is to be 100 pounds lighter than last year when he started. The year will be up in 6 weeks. And it looks like he’s going to make it! Basically, he eats lots of veggies, lean protein and green tea. Do you like sushi? He has that about 3x a week; he likes it because you can get a variety of different rolls and stay in the fresh produce category. I think one of the hardest things about dieting is feeling bored with food, but Micah comes up with creative meals. He also walks around the neighborhood or runs 40 minutes every other day and does strength training on the Wii on the off days. Godspeed. I hope you reach your goal by the reunion! Actually, generally you lose MORE weight swimming. It’s more resistive, but less jarring. I meant that you don’t lose weight as FAST by swimming. Nichole: It’s probably warmer here, but our house is very poorly insulated. Even though my in-laws’ house is 40 years older than our house, it was SO MUCH WARMER up there. I was even hot at times! Our windows are crap (4 of them are broken). I don’t feel like our heater is very good; just two small vents to cover the entire living/dining room area. And blech, hate sushi. Hehe But congrats to Micah! That is great! I am currently going on junk withdrawal. I was trying to explain to Paul how dieting is so hard for me because given the choice between eating something healthy that I don’t really like and not eating at all, I usually opt for the latter. Bethany: To be honest, it’s the purchase of a bike & helmet that are really keeping me. Ashley—glad to hear about the thoughts on the triathlon…i started out very low budget. either borrow a bike or look at craigs list. you definitely don’t need bike shoes for the first couple races. you should be able to get a bike helmet for $25. i can give you a ton more info if you would like. contact me on facebook if more questions. Go for it!! Heather: Can you use just any bike? I thought I would need to get one specifically for racing.